Psssst – have you heard? 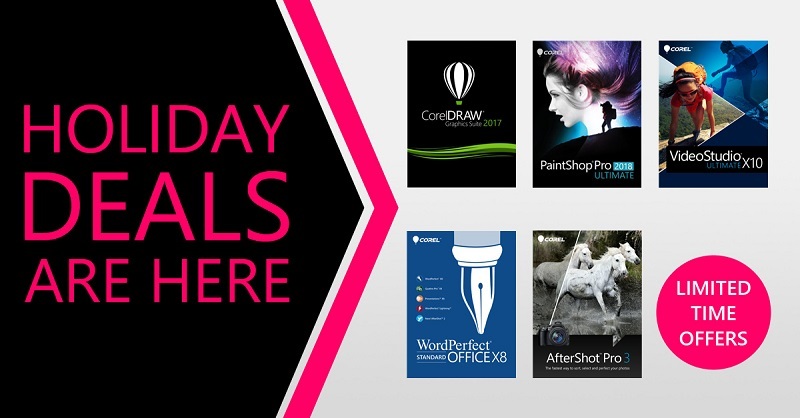 We have some amazing Black Friday deals waiting for you at www.corel.com! If you’ve been holding out all year so you can save BIG, now is your chance to score huge discounts when you buy or upgrade to some of our latest titles. Save up to 50% on some of our newest versions including CorelDRAW Graphics Suite 2017, Painter 2018, ParticleShop, PaintShop Pro 2018, AfterShot Pro 3, VideoStudio X10, Pinnacle Studio, Roxio Toast, WordPerfect Office and more during our biggest sale of the year. CorelDRAW Graphics Suite 2017: Combine your creativity with the unparalleled power of CorelDRAW Graphics Suite 2017 to design graphics and layouts, edit photos, and create websites. With the revolutionary new LiveSketch tool, advanced support for the latest hardware, and much more, this complete suite lets graphics pros, design enthusiasts, and business users achieve professional results with speed and confidence. Now save 20% and get valuable extras: ParticleShop and WinZip 21.5. Painter 2018: Painter 2018 sets the standard for digital art & painting software. Expand your artistic capabilities using a phenomenal collection of the world’s most realistic digital Natural-Media® brushes. Accomplish natural, professional results and leave people asking – is that real paint or Painter? Available for Mac and Windows, now save 30% and get valuable extras, including the Bob Ross® Brush Pack. ParticleShop: This powerful plug-in enables photographers, artists, and designers to create incredible images previously only possible in their imaginations. Compatible with Photoshop, as well as Corel photo editing and graphic design apps, ParticleShop brings new levels of creativity with brushes that spring, flow, gravitate, and glow based on the user’s unique expression. Available for Mac and Windows, save 20% on ParticleShop and get valuable extras, including an exclusive brush pack! PaintShop Pro 2018 Ultimate: Get professional results for less with PaintShop Pro 2018 – now including a faster, easier-to-learn interface. Now save 50% and get valuable extras: ParticleShop, WinZip® 21.5, and PaintShop Pro Holiday Scripts. AfterShot Pro 3: Harness the power of AfterShot Pro 3 to sort, select, and perfect your photos faster than ever before. Manage your photo collection, enhance your RAW files, and batch process thousands of photos at once. Available for Mac, Windows, and Linux, save 50% off and get valuable extras: ParticleShop and WinZip 21.5. VideoStudio X10.5: Easy-to-use and loaded with creative features, VideoStudio lets you make every video look its best. Now with Multi-Camera Editing, 360 Video Editing, Time Remapping, and more! Save 50% and get valuable extras: NewBlue Art Effects and WinZip 21.5. Pinnacle Studio 21 Ultimate: Edit your way with power, creativity, and control. Get the pro-quality results you want with precision editing on unlimited tracks. Work faster thanks to a newly redesigned and simplified interface. Save 23% and get valuable extras, including the Pinnacle Studio Blu-ray Plugin, PaintShop Pro X9, NewBlue Light Effects, and WinZip 21.5. Roxio Toast 16 Pro: Take advantage of this powerful multimedia and disc burning suite for Mac, now with new MultiCam Capture™. The ideal match for your favorite video editing software, Roxio Toast 16 Pro makes it simple to capture, copy, convert, burn, and share your digital media. Save 33%. WordPerfect Office X8 Professional: Get the latest version of Corel’s legendary office suite with new and enhanced features driven by customers’ top requests. Power users can be more productive with improvements to the unique features they rely on most, including Reveal Codes, function keys, file compatibility, templates, and more. For users who need the power of a true office suite, WordPerfect Office X8 Professional is available now for up to 60% off, plus get valuable extras: WinZip 21.5 and the Holiday Stationery Pack. These savings won’t last forever… so head on over to www.corel.com before these deals disappear! For more information, including a complete list of offers and regional pricing, please visit www.corel.com, www.pinnaclesys.com, and www.roxio.com. This entry was posted in News and tagged Black Friday, Corel, Digital art, Discount, graphic design, Office productivity, Photo editing, Sale, video editing. Bookmark the permalink.